Fall in love with the azure waters of the British Virgin Islands, the perfect weather, and the friendly, laid back people. What really makes this paradise special is the 31 islands set in a rough circle which form a protective barrier from the open ocean swell. There generally is no under tow or dangerous currents because the spring high and low water is only 14 inches which means very little water movement. The consistent Caribbean trade winds will carry you to idyllic island vistas with unspoiled white sand beaches encrusted with coconut palms. Snorkel among pristine coral reefs teeming with rainbow colored fish and sea life is what draws all of us back. Captains have named the Virgin Islands "Peter Pan land" for adults. The ultimate in luxury, exquisite cuisine, exciting water activities and plenty of time to relax and unwind, your friendly professional crew will see that your time aboard Good Medicine is your vacation of a lifetime. 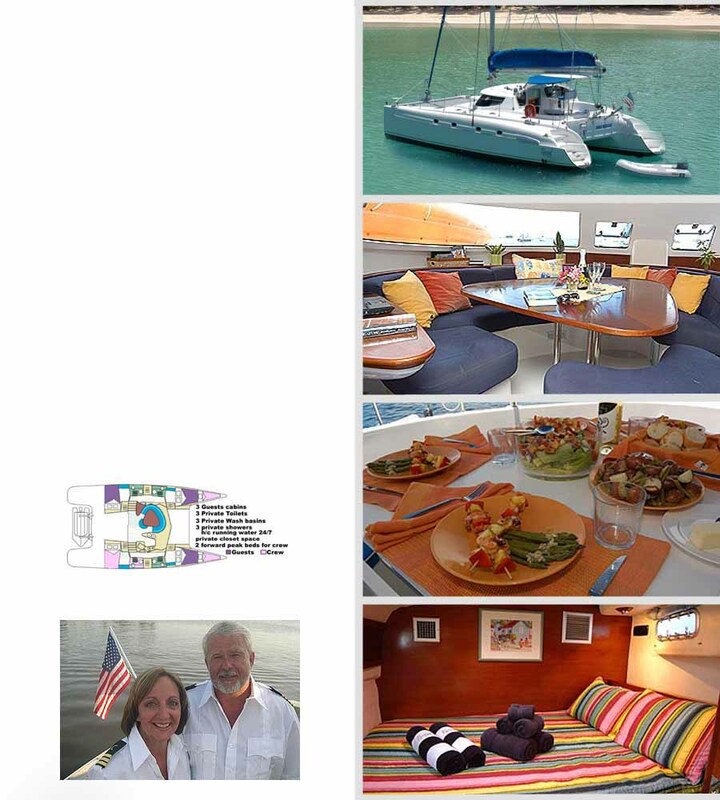 Good Medicine is a 2004 Fontaine Pajot Bahia 46 luxury sailing catamaran. Here is a gorgeous new catamaran which smells brand new inside and you can see she is new. Good Medicine has 3 queen staterooms for six adults as well as two small fore peek small beds for 2 children. All cabins have private amenities, hot and cold running water avaialable 24 hours, sea view hatches and are fully air conditioned. Each cabin is luxuriously appointed with fine wood veneers and storage cabinets, halogen lighting (including individually controlled reading lights), and fine colorful linens. The flexible layout allows for two additional fore peak single cabins, which is ideal for family groups (up to 8). She is perfectly designed for 6 adults. Mike Little, was born and raised in eastern North Carolina. It was on The Pamlico River - at the age of 8 - that he began dreaming of a career on the water. Since then, Mike has traveled extensively in the US Air Force and has gone on to sail the Puget Sound and San Juan Islands as well as the U.S. East Coast. He has earned his Master's License and spent the last 6 years owning and operating a sailing charter business in Washington, NC. Mike has a passion for life on the water and is happiest when he can share his love of sailing. He believes that "no matter what you see and do on the water, it never gets old. You can see 100 sunsets and each one is as pretty and as special as the first."